So last week I wrote a post about the new Dark Angels Codex and why I very excited about it. This week I wanted to write a short piece about the army I've decided to field and why. For those of you who aren't into the GW hobby I'll be shifting focus next week so have no fear. ALSO THIS IS MY SHOW AND I'LL DO WHAT I WANT. So as I mentioned last week I have a massive amount of Dark Angels gathering dust in a box at the moment; most of which are Terminators because I like Terminators. Actually I love Terminators. Power Armour Space Marines are all well and good but Terminators have always captured my imagination more. It should come as no surprise then that I am currently building a Deathwing Army. The Army List: What's Hitting the Field? Mastery Lvl 2 Librarian with Terminator Armour. 3 Ravenwing Bikes with plasma gun, Melta gun and Veteran Sargent with power weapon. 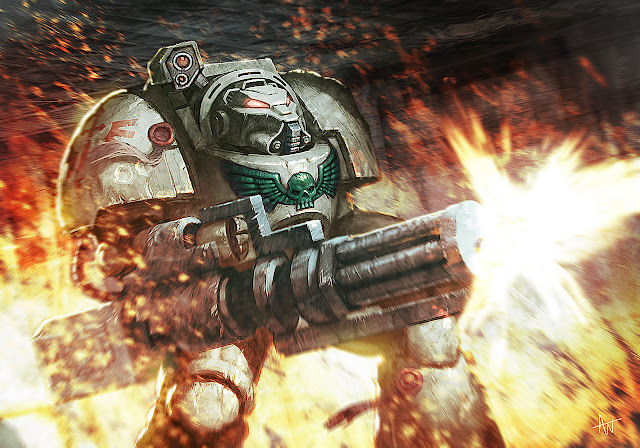 I've decided to go for a close combat/ medium to short range fire-power army that combines Ravenwing Bikes and Deathwing Terminators along with a few additions for fun. All but one of the units in the army Deep Strike; as a veteran of many Tau defeats I understand this is risky business but new special rules mean that - with careful planning - none of my terminators should scatter off the table/ into impassible terrain and mishap. All Ravenwing bike units have teleport homers also Belial and the squad he joins do not scatter; this allows me to form two pincers of a two pronged attack on tough enemy units or a hammer and anvil to crack formations apart on. Any objectives that need defending can also be covered by the bikes as they can disengage from combat with Hit and Run then Turbo Boost 36'' across the table to provide a safe landing zone. As you can Imagine, a Terminator army is very expensive points wise. My planned 1500 point army has only 25 models in it. This makes deployment and overlapping fields of fire very important. Luckily a change to the Deathwing Assault special rule means that you can bring any number of Deathwing units in from reserve on the first and second turns of the game, not just half of them on turn one. this allows my bikes to get into position to prevent the vanguard from scattering and Belial and his Command squad to drop in somewhere very inconvenient amongst the squishiest part of the enemy army forcing them to spread out so I can divide and conquer. So that's what I'm planning to field this year. I'll be posting pictures of the units as I finish them (bikes are almost done) feel free to tell me how wrong my army list is in the comments. Or don't, that works to. If you fancy a game I tend to be in/ near Warhammer World/ the Leamington Games Workshop most weekends so drop me a message!